National Basketball League Semi-final; Game 2. Tuesday 23 February 2010; Gold Coast Convention & Exhibition Centre, Broadbeach, Queensland, Australia. James Harvey shoots from the corner over Drew Williamson. 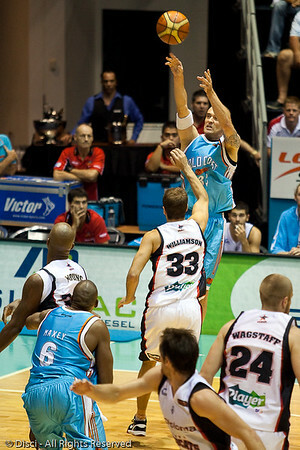 - Gold Coast Blaze v Perth Wildcats Semi-final G2, 23 February 2010. After being down for most of the game, the Wildcats came back in the final minutes to score an 82-78 win. Wildcat import Kevin Lisch scored 11 of his 18 points in the final five minutes to help his team to the win.